This is a three-part brief description of the World Stove Everything Nice stove made by Al Hislop and Patty Roberts, with Ron Larson participating in the first tests, January, 2010. 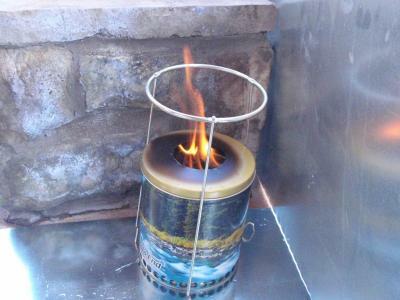 Al made an Everything Nice pyrolyzer from the design on the World Stove website. We used a large coffee can and then a canister for the two cans so it was rather large. We first tried pine cones but they just smoked so we put in pellets instead. This gave a good clean burn and we put a tripod over the stove and boiled water, heated soup, cooked pasta and cooked pasta sauce with fresh meat and fresh vegetables. When the flame extinguished, there was still some smoke coming from the stove so it was covered on the top to remove oxygen and set in a shallow basin of water on the bottom. This extinguished the smoke but moistened the bottom of the char slightly. 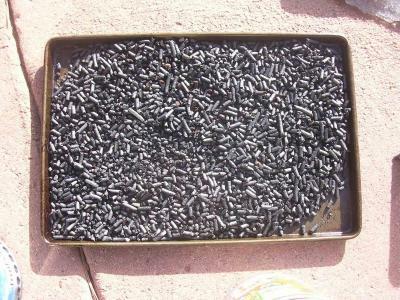 When we emptied the stove, we saw that some of the pellets had not pyrolyzed. We believe this was because of the fairly large diameter of the can. 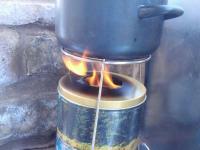 To dry the char and pyrolyze the remaining pellets, we put the mass into a canister and put it into our hot wood stove. This allowed complete pyrolysis of the remaining pellets and provided complete drying of the fuel. It’s possible that this changed the pH of the char from its original pH because of a different pyrolysis temperature. Time: 2 hours and 20 minutes of a very good, clean, strong burn. torch, there was never any massive smoking. the same flame for a total of more than 4 hours over two experiments. controlling the air flow. You should also next see a "convection skirt"
of the type being sold by Aprovecho. Using the same stove as yesterday, but this time with a cone in the center to displace the area that didn’t pyrolyze yesterday, we filled the stove with pellets again. This time however the stove had 15% less fuel because of the cone. We spent about a half hour trying to light the stove with twigs, vasoline, pine needles, paper, some other fluffy combustibles and fondue fuel. None of these things got the stove going. We ended up using the torch again. The torch lit the pellets in a minute or so and then it took about 15 minutes before we saw the good, steady, smokeless cooking flame. Once we got that good flame, we measured 2 hours 23 minutes of pyrolysis. The stove burned for the about the same amount of time as yesterday, but this time all the pellets were pyrolyzed. The outer can seemed to have the same temperature pattern today as yesterday. Those temperatures were pretty consistent until the pyrolysis ended and we put a cap on the top. Unlike yesterday, we didn’t put the bottom in water. Smoke began to come out of the holes at the bottom and the temperature at the bottom began to rise. We suspected that some combustion was starting to take place. We poured the pellets into a tray but they seemed to be getting hotter rather than cooler so we scooped them into another canister and put on a tight lid so no more oxygen would be available. 2+ hours of operation one time. Note the many interior small holes. we get the tight blue flame mentioned in the instructions. there was perhaps 35-40% shrinkage. taken up by the cone. New plans and new ideas: We want a sliding band around the bottom of the can which can be used to regulate airflow through the holes and maybe the pyrolysis rate. When the band slides down, it will partially close the holes. When pyrolisis has finished, the band can be pushed all the way down to cover the holes entirely and keep oxygen out. The inner tin was a Yuban Coffee can, with diameter 6.05 inches (excluding the roll bead where the bottom is attached. The original height of the can was 7.5 inches, and the height was trimmed down to 6.7 inches above the inside of the bottom surface. 74 holes .0.159 inch diameter were drilled on a line 0.75 inches from the bottom. The outer tin was a decorative cookie tin with a fitted lid. The diameter of the can (excluding the rolled bead that attached the bottom) was 6.4 inches. A 3 inch diameter hole was cut in the center of the lid. The lid was 7.1 inches above the inside of the bottom of the can. 33 holes of 0.5 inch diameter were drilled as close as possible to the bottom of the outer can. 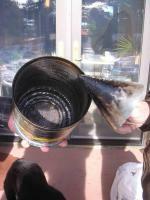 The inner can was filled to about ¾ inch of its top with pine pellets intended for use with pellet stoves. The weight of the fuel was 58.5 oz (1.66 kg). These pellets were ignited using a propane torch over the entire top surface for about 1 minute. The stove operated with what appeared to be constant output for 140 minutes. A water heating test was performed with a pot set about 3 inches above the stove opening. Two liters of water was placed in a covered pot of diameter 8.5 inches and height (without lid) of 3 inches. Water temperature was measured using a “point-and-shoot” infrared thermometer. (I suspect that at higher temperatures this thermometer reads low, as it most likely senses the temperature of the steam above the water in the pot, and not the water itself.) Water start temperature was 12.5C, and finish temperature was 81.1C, at which time boiling bubbles were coming off the bottom of the pot, and much energy was being lost to steam. Elapsed time was 17 minutes. When the flame extinguished, much smoke came from the stove, so a lid without a hole was placed on top of the stove. Smoke continued to pour from the holes at the bottom of the stove, so it was placed in a pan of water to cover the holes. This resulted in wetting of the contents of the stove. After cooling, the stove was opened and the contents examined. 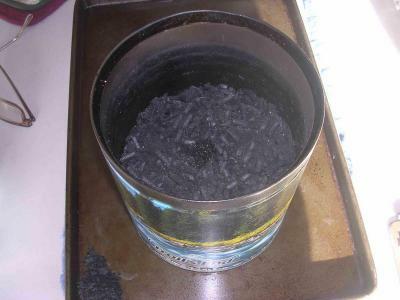 The fuel was found to have been converted to char, except for a portion of pellets about 1.5 inches high and 3 inches in diameter at the bottom of the stove. Since the fuel was wet, it was not weighed. 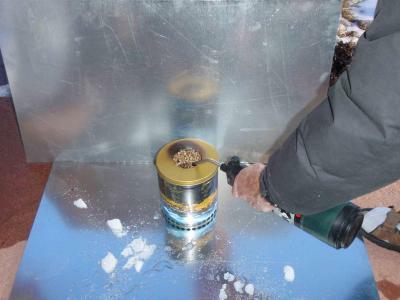 Instead, the wet fuel including the unconverted pellets was placed in a container and heated to complete pyrolization. The weight of the remaining char was 16.5 oz (28.2% original weight). A hollow metal cone of height 4.5 inches and diameter 4.5 inches was made, and placed in the bottom of the inner can before adding fuel pellets for a second run. This time the weight of the fuel was 49.5 oz, the burn time was again 140 minutes, and the weight of the remaining char was 14 oz (28.3% original weight). This time all but 1 or 2 pellets appeared to have been converted to char. that may lead to improvements for all similar types. loop to look like upward movement only. think) about 1.5 kg load of pellets. There were no obvious odors. cone). This not possible with TLUDs. 8. Anyone else able to comment on this TLOD "Everything Nice"
design and any changes they may have attempted? giving the plans away free.